Finally, the reason why a bad shock cannot be ruled out is that the Eurozone is still plagued by severe imbalances in its banking and financial system. According to the IMF's latest Global Financial Stability Report, one in three banks in the Eurozone must confront severe challenges due to legacy issues (900 billion of non-performing loans and an unspecified amount of toxic assets), and the need to revise business models to respond to a sharply modified economic environment, and adapt to taxing regulatory changes. Let me note in passing that the Italian banking system only makes up for about a third of the bad loans, and is virtually clean of other toxic assets. As bank stocks often trade at heavy discounts from book value, raising fresh capital in the market can be prohibitively expensive, raising the cost of capital well above the banks’ ability to remunerate it. 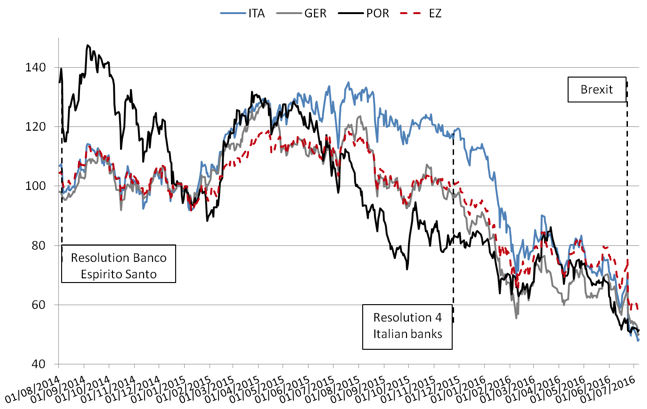 This aggregate fragility has come to the fore after the British referendum, with bank stocks sinking to new lows throughout European markets (Figure 1). IMF (2016), Global Financial Stability Report: Potent policies for a successful normalization, April.